All the essentials. All photos by Francesco Spighi. 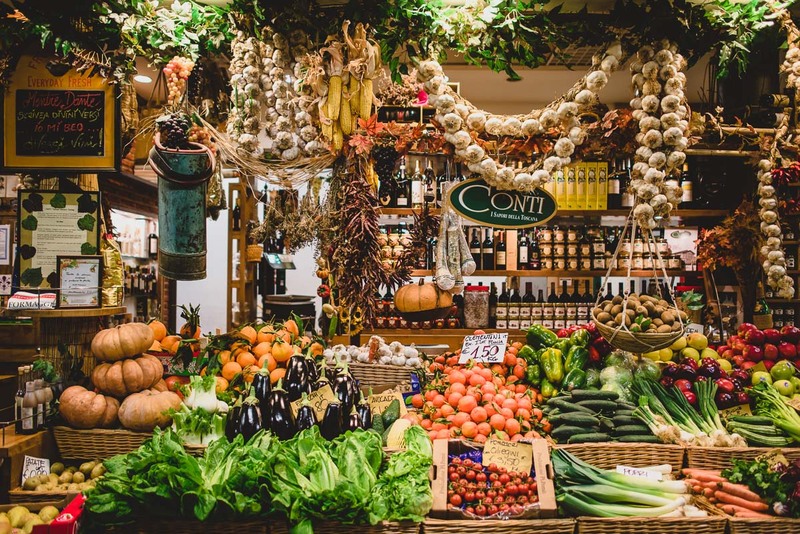 This is what it looks like when two James Beard Award-winning chefs go food shopping in Florence, Italy. 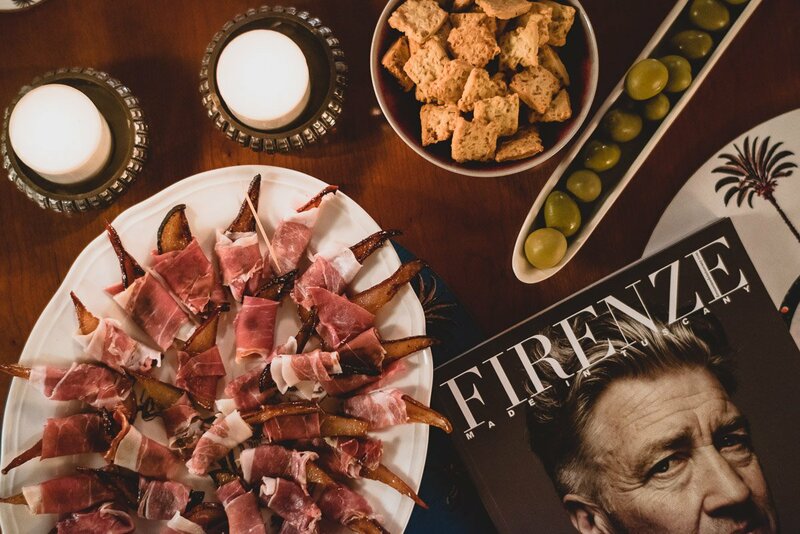 Mark Gaier and Clark Frasier (of lauded Maine restaurants Arrows and MC Perkins Cove) revisit the old-world flavors of Tuscany by throwing a dinner party at the home of their Florentine friend in an 11th-century building 100 yards from the Arno River. 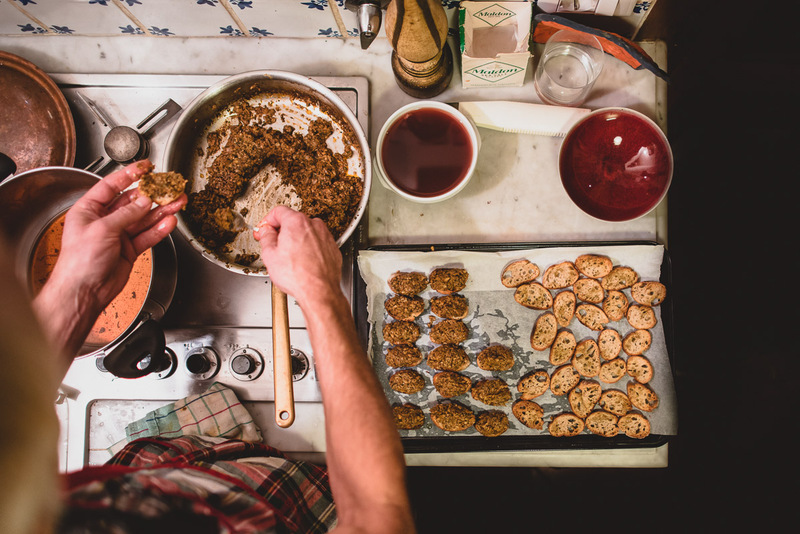 FLORENCE – We wanted to revisit the old-world flavors of Florence, Bologna, and Venice that inspire our cooking. For example, we used a 40-inch steel spit to roast specialties at our old restuarant, Spiedo (spiedo was a popular Renaissance technique or spit-roasting). We thought it would be a good idea to throw a dinner party in the home of our local Florentine friend, Mario D'onglhio, who lives in an 11th-century building a stone's throw from the Arno River. Mario made his career taking care of Florentine nobility — building friendships with the likes of Marchesi Frescobaldi and working on Hotel Splendido and at Excelsior Hotel and at famed restaurant San Domenico. The essentials: The region's signature paper stationary for dinner invites, Ginori china for the table, local cheese, charcuterie, wine, a great fashion accessory, of course, and some culture (for dinner party fodder). Here's where we found them. One of many parts of a succesful dinner party. This store sells gorgeous housewares ranging from classic to modern in a multi-level store that is very sophisticated. We bought our china here after being together for 25 years (don't pick out the tableware too soon!). They have great sales in January. Go here for handmade shoes and other leather goods such as luggage and bags. As our local friend Mario says, "That is not a shoe, that is a Rolls Royce!" Although very expensive, the quality is obvious. They too, have amazing sales in January (look out!). They will only buzz you in if you look like you can afford their merchandise, so dress well. 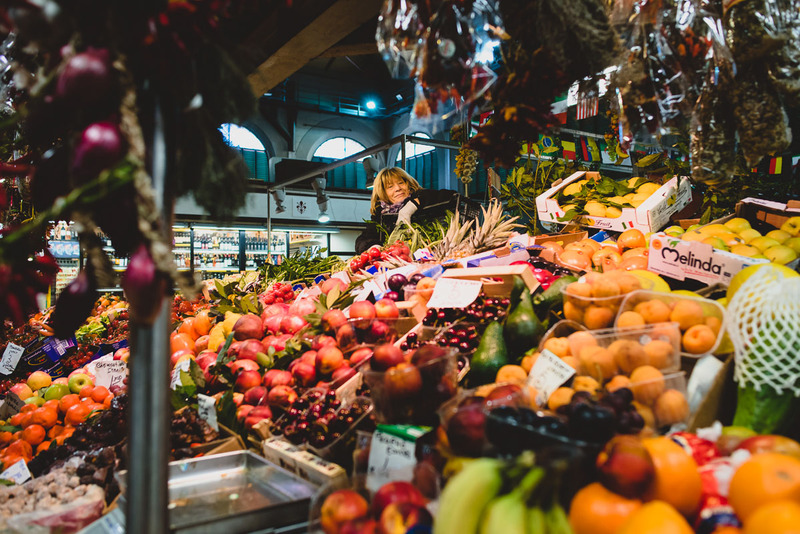 The bustling marketplace has always been a great place to shop seasonally, but now has the added enticement of an entire new top level featuring fantastic mini restaurants, bakeries, pizza places, and high-end food goods — all with a stylish modern look. It's on par with many of the best food halls you see popping up in NYC. 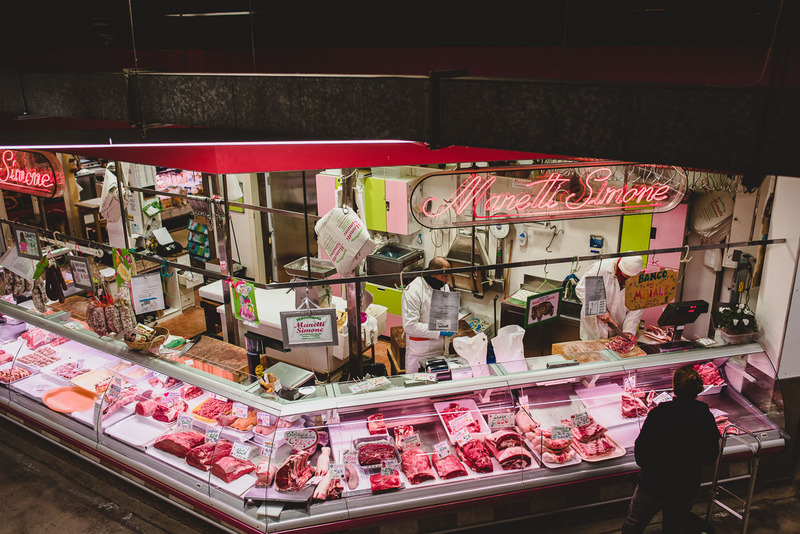 A butcher's stand at Mercato Centrale. A fruit stand at Mercato Centrale. The produce at Mercato Centrale. Sure, you can find this brand from Shanghai to Beverly Hills, but it's more fun to shop in Florence, right on the Arno. The clerks are lovely and never rush you. If you still like to wear a tie, as we do occasionally, their offerings are beautiful. And, of course, every gentleman should have a pair of Ferragamo loafers! After climbing to the top of the former city hall, make sure to go to the charming museum where you will see, among other famous works of art, the first bronze cast since the fall of the Roman Empire: David by Donatello (not to be confused with Michelangelo's later, more famous David). We think it is one of the most lovely pieces of art anywhere. Not only is this palace considered by many architects as a game-changing building, it also regularly holds great art exhibits — such as one last year on the Fascist art of 1930's. Your concierge can tell you what's on at the museum. The famed five-star Cibreo is across the street on Via A. Del Verrochio 5r. But though the cafe is a cozier affair, the intensely detailed lunch menu hints at the richness and complexity of the regional cuisine. Mark and Clark are the chef owners of in Maine. They travel for the food.